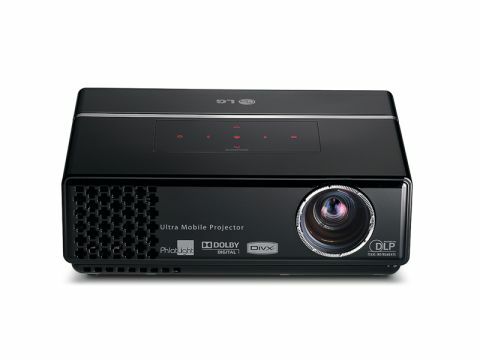 The LG HS102 occupies the same market space as the Acer K10, being a mini-DLP projector designed for travel use. Weighing just 750g, it is a compact device and ideal for travellers looking to keep their kit to a minimum. The plastic casing feels solid to the touch and we were impressed with how robust this device feels. The same DLP chip and LED bulb arrangement as you'll find in the Acer K10 has been used here. However, where the two differ is, apart from being slightly bigger, the LG also has Audio-in and Audio-out ports. One nice feature is the addition of a USB port, which means you'll be able to present video, images and even music directly from a USB memory key. The navigation system is rather basic, as are the number of formats supported – JPEG, MP3 and DivX – but we found it worked reasonably well. To make the most of the software, you'll need to use the supplied remote control. Controls on the top of the unit are based around a touch-sensitive pad instead of dedicated buttons. They offer the standard array of tools, including Source and Menu buttons. We found the buttons to be highly responsive, so setting up this projector is simple. When it comes to projection, this unit has the same 160 ANSI lumens rating as the Acer and we found the image brightness to be comparable. The base resolution is 800 x 600 pixels, which is more than usable if you're looking to use this machine with a standard netbook, for example. With a maximum upscaling resolution of 1280 x 1024 pixels, you'll also be able to watch HD content. Image quality was more than acceptable, though there was a fair degree of jagging when trying to run anything other than DivX video formats. Overall, the HS102 is an impressive projector with a number of features that make the additional cost over the Acer, more than acceptable.